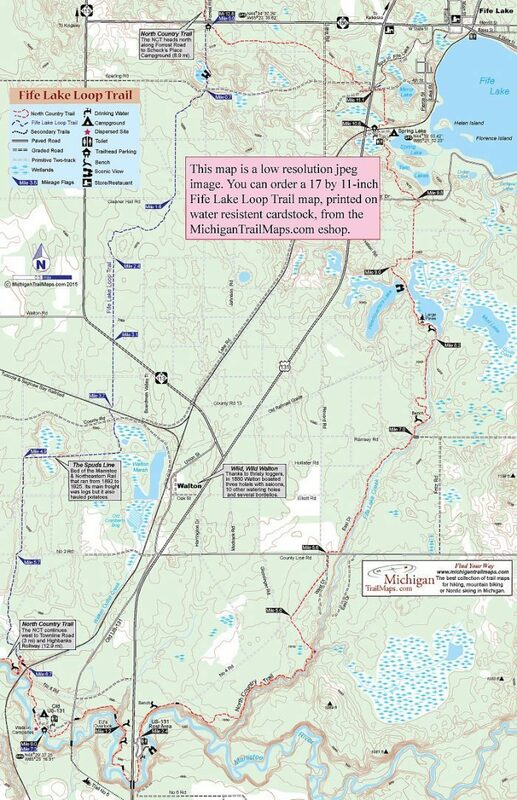 To order the new 17- by 11-inch trail map to the Fife Lake Loop Trail click on the MichiganTrailMaps.com's eshop. The reroute required a year of planning with actual construction of the 12.8-mile trail beginning in 2012. Right from the start it was decided to maintain the original NCT and form a 21-mile loop like the popular Manistee River Trail to the south. On National Trails Day in 2014 the new path was dedicated as the North Country Trail and the entire loop as the Fife Lake Loop Trail. 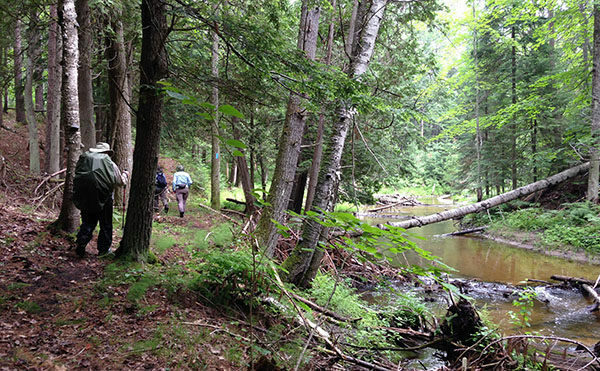 The NCT now heads east from its junction with the original trail, skirts the scenic Manistee River for almost 4 miles, heads north along Fife Lake Creek, winds through the picturesque Headquarters Lake region to Spring Lake State Forest Campground. The entire loop makes for an overnight outing and a perfect weekend backpack. 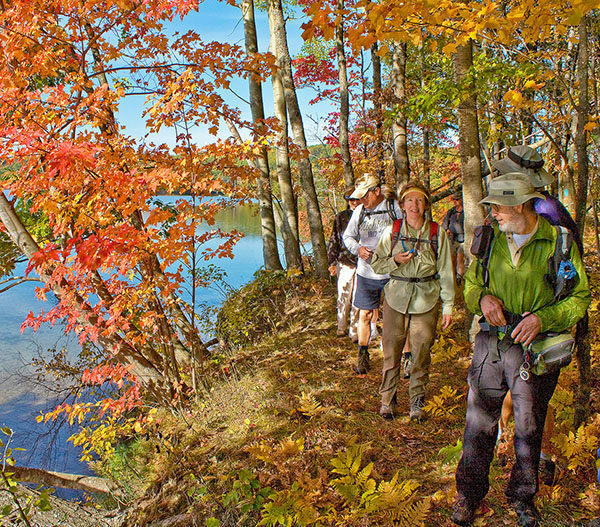 Many arrive Friday at Old US-131 Campground and enjoy the most scenic portion – the 10.6-mile walk to Spring Lake Campground – the next day. 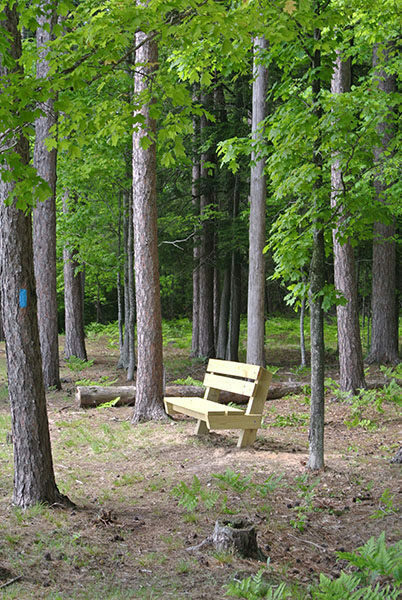 Sunday is a 9.5-mile trek to return to the Old US-131 trailhead where they can depart for home or pitch their tent for the night on the banks of the Manistee River in the campground’s walk-in campsites. 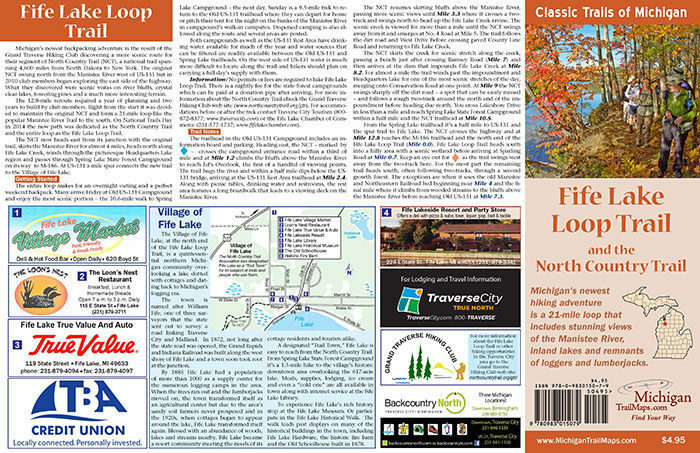 Click Here to order a detailed trail map and guide to the Fife Lake Loop Trail from the MichiganTrailMaps.com's eshop. The Fife Lake Loop Trail map is part of the Classic Trails of Michigan series from MichiganTrailMaps.com. The large format map measures 11 by 17 inches, is printed on durable card stock and coated to be water resistant. Includes all distance markers, contour lines, historic buildings and ruins. Best of all, when folded it fits in your back pocket or the side pouch of your pack. Old US-131 and Spring Lake Campgrounds as well as the US-131 Rest Area have drinking water available for much of the year. Water sources that can be filtered are readily available between the Old US-131 and Spring Lake trailheads. On the west side of US-131 water is much more difficult to locate along the trail and hikers should plan on carrying a full day’s supply with them. Dispersed camping is allowed along the route and several areas are posted. Spur trail near Spring Lake makes it possible to spend the evening in the historic village of Fife Lake, a former logging community dating back to 1872. Within town there are accommodations, supplies, a variety of restaurants and even a place to kick back and enjoy a cold one. 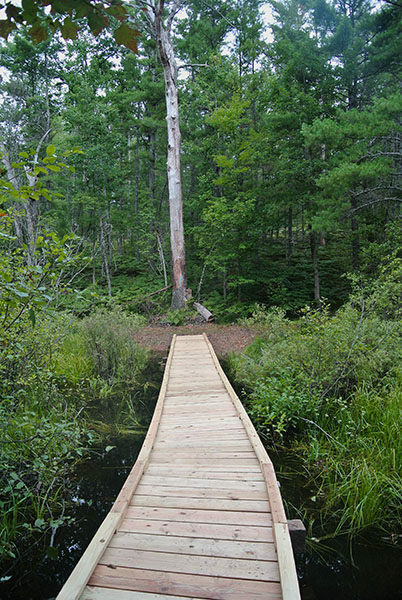 No permits or fees are required to hike Fife Lake Loop Trail. There is a nightly fee for the state forest campgrounds which can be paid at a donation pipe after arriving. 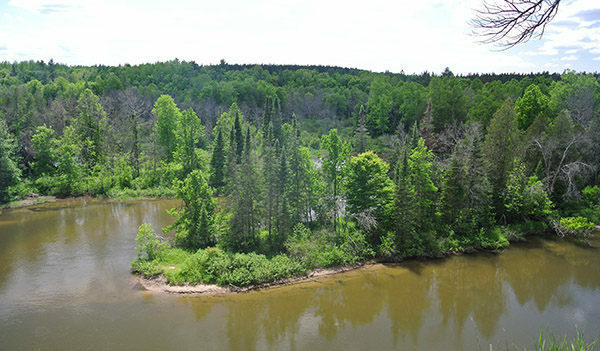 Old US-131 State Forest Campground is off of US-131 on the banks of the Manistee River 7 miles either north of Manton or south of the village of Fife Lake. There are also trailheads for the loop at Spring Lake State Forest Campground and along M-186, 2 miles west of Fife Lake. 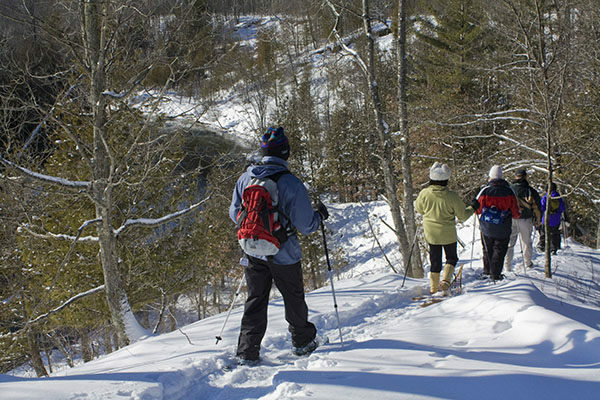 For more information about the North Country Trail check the Grand Traverse Hiking Club web site (www.northcountrytrail.org/gtr). For accommodations before or after the trek contact Traverse City Tourism (800-872-8377; www.traversecity.com) or the Fife Lake Chamber of Commerce (231-577-1737; www.fifelakechamber.com).